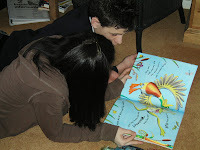 I could not resist sharing this photo of two teenagers enjoying a picture book together. Encouraging reading for pleasure is the focus of lots of my training, and a good deal of my voluntary activity, so I was delighted to read this erudite and impassioned plea by Graham Maslen, headteacher of North Halifax Grammar School. It contains an extremely useful round-up of research on the subject. It is heartening that the latest guidance for Ofsted inspectors on reading, writing and communication makes a number of references to the importance of reading for pleasure. I blogged a few months ago about the DfE website guidance on fostering reading enjoyment. Michael Rosen’s Reading Revolution website has some excellent ideas for creating a reading school. For some practical tips, take a look at his 20 point plan. It is well worth keeping an eye on Rosen’s blog too. Both school and public libraries of course play a huge role in fostering reading enjoyment. For anyone who has not seen it, this is a recent article of mine on the role of libraries in encouraging reading enjoyment among teenagers.